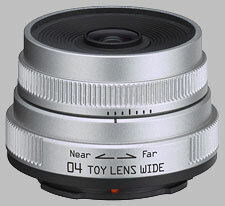 (From Pentax lens literature) The PENTAX 04 Toy Lens Wide for Q-series cameras is designed to provide a wide angle, nostalgic image similar to photographs taken through a traditional toy camera. It is perfect for photographers looking for a toy camera effect, without having to simulate it in post-production. The Pentax Q 6.3mm f/7.1 04 Toy Wide doesn't have any user reviews yet!